Even Porsche sees the need for and all-electric, emissions-free truck. A recent press release from Porsche divulges that a "virtually silent" commercial-grade, 32-ton electric truck is on the way for early 2019. According to Porsche, it has commissioned the all-electric MAN eTGM for the initial purpose of logistics at its Stuttgart-Zuffenhausen site. This will be the first truck of its kind going into series production in Germany. By integrating the eTruck into our production logistics, Porsche is taking another step on the path to the ‘zero-impact factory’. As Porsche moves forward with the production of its upcoming Taycan variants, its goal is to have a zero-impact factory. The automaker has already been relying on renewable energy for two years. In addition, its railway situation uses natural power. Now, it will push forward even further to assure that its trucks, transporters, and forklifts emit zero emissions. The battery-powered eTruck is a MAN eTGM 18.360 4x2 LL. The type designation indicates that the truck is a semitrailer tractor and belongs to the 18-tonne weight class, while the overall combination with a semitrailer is designed for a total weight of 32 tonnes in delivery traffic. The 360 figure represents the horsepower of the 265 kW eTruck. 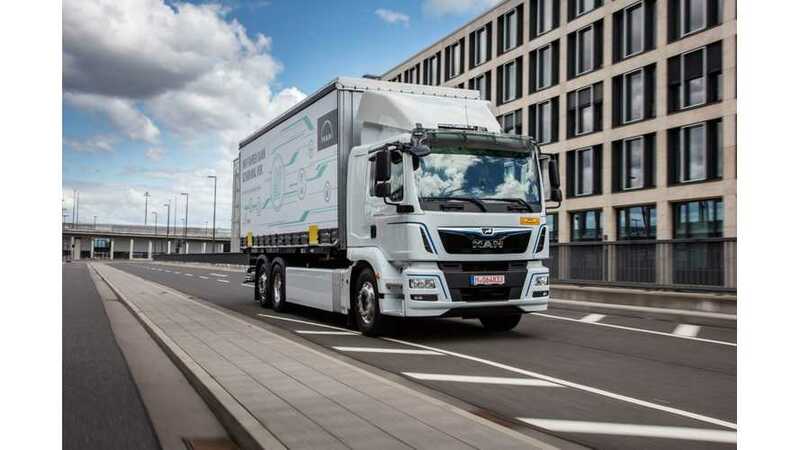 Lithium-ion batteries with a storage capacity of 149 kWh are used to store energy, making it possible for the eTruck to cover a range of 130 kilometres. With the MAN eTGM, electric commercial vehicles have taken a large step towards series production and can now reliably demonstrate their abilities in everyday operation. What we have learned – together with Porsche – in the context of regular factory logistics will be incorporated into the first small series, which MAN hopes to launch as soon as 2019. Specifically, these Porsche / MAN commercial trucks will used for deliveries from the company's factory in Stuttgart-Zuffenhausen to and from the Freiberg am Neckar site, which is about 19 kilometers away. Porsche says this push will eliminate some 30,000 kilograms of CO2 emissions per year.